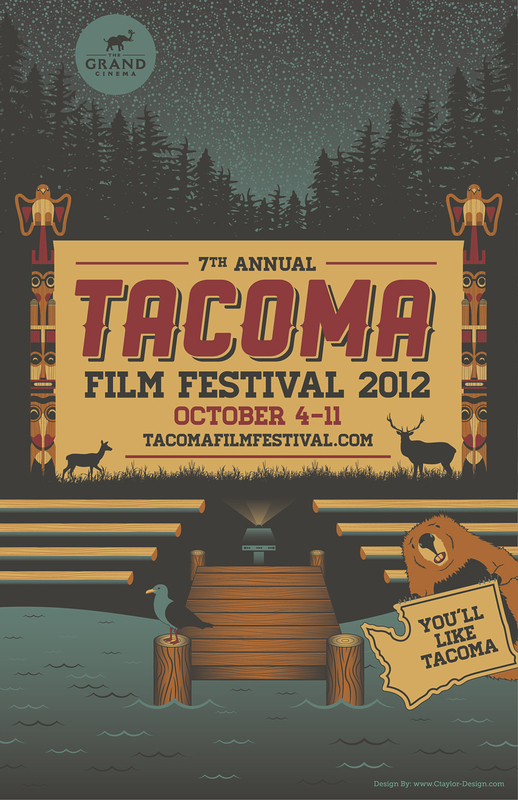 The official Tacoma Film Festival poster design for 2012 has been announced, and the winner is graphic artist Cameron Taylor of Hundred, WV. Each year, the Grand Cinema’s poster contest sets the tone and provides (a trailer of sorts? ), for one of Tacoma’s fave cultural events. The 2012 Tacoma Film Festival opens Thursday, October 4, and runs through Thursday, October 11, with screenings at the Grand Cinema, Tacoma Art Museum, Museum of Glass, Blue Mouse Theater and the University of Washington-Tacoma. The official Tacoma Film Festival program will be available on Thursday, Sept. 13. For more information visit www.TacomaFilmFestival.com. Beaver, deer and other friendly Pacific Northwest denizens are framed by totems under a twilight sky in Taylor’s nostalgic artwork – check it out around town, soon!